However, offscreen, she focuses on her passions one of which veganism. She explained how she’d always been an animal lover, and became vegetarian at age 19. As she gradually cut out most dairy in college, she found that her health improved. But it wasn’t until she read Eating Animals by Jonathan Safran Foer that she became fully vegan, embracing all the environmental reasons, nutritional and health reasons, and the ethical reasons for staying clear of animal products. As a busy working mom, raising two boys, she tries not to spend too much time in the kitchen, so she cooks food that can be frozen and reheated, or simple foods that can be assembled easily, such as burritos with beans and rice, with a little vegan cheese and sliced avocado on top. She’s even found time to write her own cookbook, Mayim’s Vegan Table: More than 100 Great-Tasting and Healthy Recipes from My Family to Yours, in which she shares many ideas on how to eat as a vegan family. We complied The Veg-Feasting Cookbook by inviting many of our favorite vegetarian and veg-friendly restaurants in the Pacific Northwest to share their best recipes with us. We added a selection of recipes from some of the most popular chefs at Vegfest, and the result was a wonderful cookbook that covers the full spectrum of the vegetarian cuisine. From classic American to Mexican, European, African and Asian, you are introduced to every major cuisine. With helpful resources such as how to stock a vegetarian kitchen, you will quickly become an expert at vegetarian cooking. Note that all recipes work well for vegans too. The neutral flavor of tofu provides the perfect vehicle for the piquant flavors of the tapenade sauce. In a food processor, pulse the capers, olives, tomatoes, parsley and lemon juice until the mixture is chopped fine. With the motor running, add ¼ cup of the olive oil in a stream and blend the tapenade sauce until emulsified. Heat the remaining 2 tablespoons olive oil in a large skillet over medium-high heat and cook the tofu until golden brown, about 2 minutes for each side. Serve the tofu topped with the tapenade sauce. It’s summertime. Time to light up the grill. Yes, there are endless possibilities for grilling without using meat or fish. This wonderful cookbook from the Book Publishing Company captures a wide variety of possibilities in one easy-to-use book. 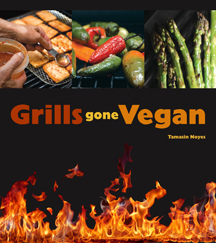 Grills Gone Vegan is the latest cookbook from Tamasin Noyes. Tamasin has been vegetarian for over thirty years, and vegan for much of that time. She and her husband, Jim, live in northeastern Ohio with their two cats. Along the way, Tamasin has baked for a vegan café, worked in restaurants, created a nonprofit group that sent handmade cards to children with life-threatening illnesses, and had a vegan soap company for ten years. Passionate about cooking, Tamasin spent several years as a cookbook tester for some of the leading vegan authors. She is also the author of American Vegan Kitchen and the coauthor of Vegan Sandwiches Save the Day. Yield: 4 sandwiches • Advance prep: Marinate the mushrooms for 1 hour. To make the sauce, put all the ingredients in a small blender and process until smooth. The sauce can be used immediately or may be stored in a covered container in the refrigerator for up to 5 days. To prepare the mushrooms, put the broth, chutney, onion, tamari, vinegar, garlic, coriander, oil, white pepper, and red pepper flakes in a small saucepan and stir to combine. Bring to a boil over medium-high heat. Decrease the heat to low and simmer uncovered, stirring occasionally, for 10 minutes. Put the mushrooms in a 13 x 9-inch nonreactive baking pan stem-side up. Pour the chutney mixture evenly over the mushrooms and let marinate at room temperature for 1 hour. To assemble the burgers, spread the sauce evenly on the cut sides of the buns. Put the mushrooms on the bottom halves of the buns. Cover with the onions, pickles, and top halves of the buns.